St. Mark’s Place & 3rd Avenue currently (l.), and proposed (r.). Last week the Landmarks Preservation Commission heard an application by a developer to transfer air rights from the landmarked Hamilton-Holly House at 3 St. Mark’s Place to make a planned new office tower at 4 St. Mark’s Place (at 3rd Avenue) 20% larger than zoning allows. Village Preservation was there to oppose the application, along with several local residents, the Historic Districts Council, and Community Board #3. 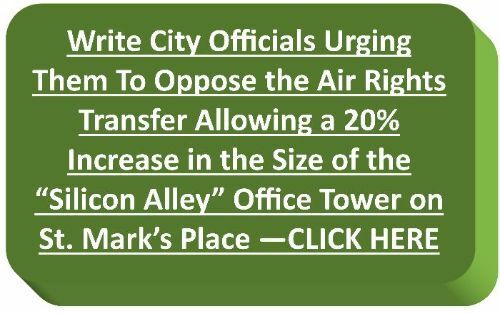 State Senator Brad Hoylman and Assemblymember Deborah Glick submitted testimony also strongly opposing the air rights transfer. City Councilmember Carlina Rivera submitted testimony but did not oppose or support the application. The planned office tower at St. Mark’s Place and 3rd Avenue is further expansion of “Silicon Alley” and “Midtown South” into Greenwich Village and the East Village, and we feel strongly that this should not be abetted with an air rights transfer. With the City Council’s approval last year of the Mayor’s rezoning for a huge new “Tech Hub” on 14th Street, and none of the meager promised neighborhood protections which were supposed to accompany it yet enacted, we can expect to see more of the same in the weeks and months ahead. If the transfer is approved by the Landmarks Preservation Commission, it will then have to be voted upon by the Borough President, the City Planning Commission, and the City Council, where Councilmember Rivera will again be able to decide if the transfer is approved.